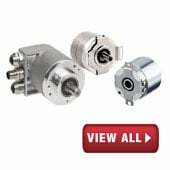 Dynapar offers a wide variety of rotary encoders for every feedback application including incremental, absolute, miniature and heavy duty rotary encoders. 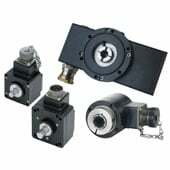 Rotary encoders come in 3 major mounting styles: hollow-shaft (hollow-bore or through shaft), hub-shaft (hub-bore) or shafted. 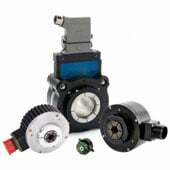 Hollow-shaft and hub-shaft rotary encoders mount directly to a motor shaft typically using a tether. 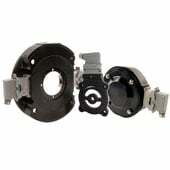 Shafted rotary encoders mount using a flexible coupling. 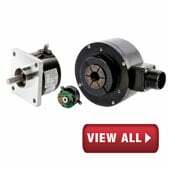 Easy to install hollow-shaft rotary encoders mount directly to a motor shaft. See bore sizes ranging from 0.25 to 2.875 inches. 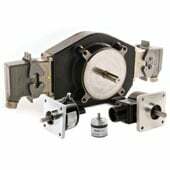 Hub-shaft rotary encoders offer direct mounting in limited space and improved sealing with no opening on the back of the encoder. 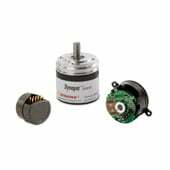 Dynapar optical rotary encoders provide high resolution, high operating speeds and reliability thanks to phased array sensing technology. 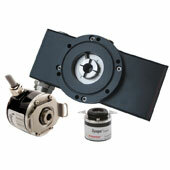 Magnetic rotary encoders are ideal for environments with dirt, dust and oil. Dynapar offers both incremental and absolute models. 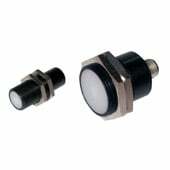 Dynapar offers miniature rotary encoders with diameters less than 1 inch for feedback applications in tight spaces. 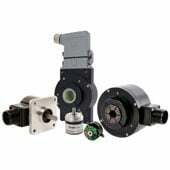 Non contact rotary encoders or shaftless encoders offer a compact package with no shaft, couplings, bearings or seals to wear out.